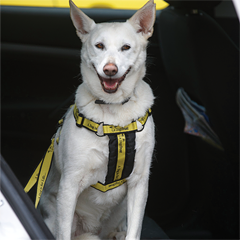 Mrs Carter rehomed Meg from our Snetterton centre last May and took one decision which probably saved the little Westie’s life; she bought a Dogs Trust car harness. For the small price of £11.99 Meg was always secure in the car. Less than three months later it proved its worth. Driving in a 40 mph zone Mrs Carter suddenly found herself face to face with a car coming in the other direction and nowhere else to go. The shock of the crash was immense. Mrs Carter’s VW Polo was written off and she had to be cut out by the fire service. The emergency services called the vet to come and collect Meg. Poor Mrs Carter suffered multiple spinal fractures and broken ribs. Reproduced by permission of Dogs Trust.